Passenger Pick-Up: For security reasons, a no-waiting restriction applies to all roads around the terminals. Therefore, use short-stay car parks when you pick up a passenger from the airport. Each day thereafter - �27. Payment Methods: Either pay by cash or card at one of the pay stations in and around the terminal, then return to your car, proceed to the exit barrier and insert your validation ticket; or proceed to the exit barrier, insert your entry ticket followed by your credit or debit card. Your card will be debited with the correct amount and a receipt issued. Help points are located at all barriers and pay stations to enable you to speak to a member of staff should you need help. 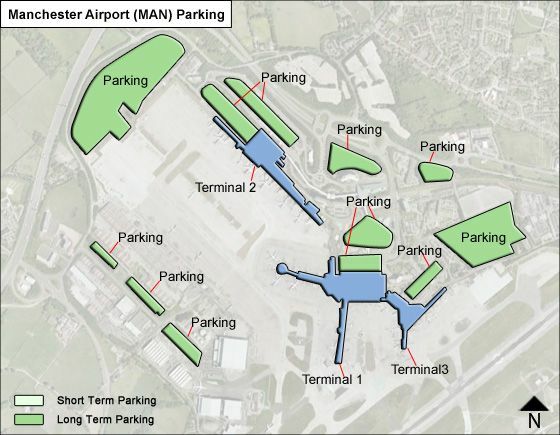 Disabled Parking: For security reasons, the blue badge scheme only applies to Manchester Airport car parks. There is no waiting outside the terminals and vehicles cannot be left unattended at any time. Clearly marked disabled bays are available in all our long stay car parks, close to the entrance or reception area. Alternative parking can be arranged in the short stay car parks. To take advantage of this option please contact us on 0871 310 2200, providing your flight details, travel dates, car registration and disabled badge number. For more information on disabled parking: e-mail [email protected] or call 0871 310 2200. A gas stations with mini supermarkets is near Terminals 1 and 2.